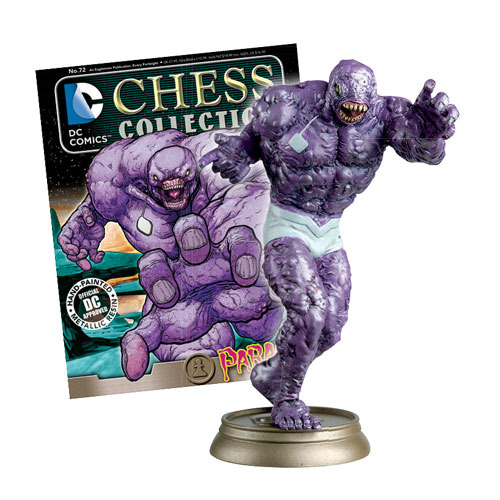 Continue your Justice League collection with this #72 DC Superhero Parasite Black Pawn Chess Piece and Magazine. Cast in resin, Parasite comes with a cool 16-page collector''s magazine. Be careful when you pick him up; he might try to absorb all your superpowers! The DC Chess Collection continues with the Justice League chess set that offers the comic fan and chess enthusiast alike the chance to collect fantastic and unique chess pieces, vivid representations of some of DC''s greatest characters. Each character is superbly rendered, cast from a specially formulated metalized resin, and painted by expert model makers, Measures about 4-inches tall. Each chess piece is accompanied by a fascinating 16-page magazine featuring superb DC Comic artwork and vital chess tips for players of all levels. Ages 14 and up.